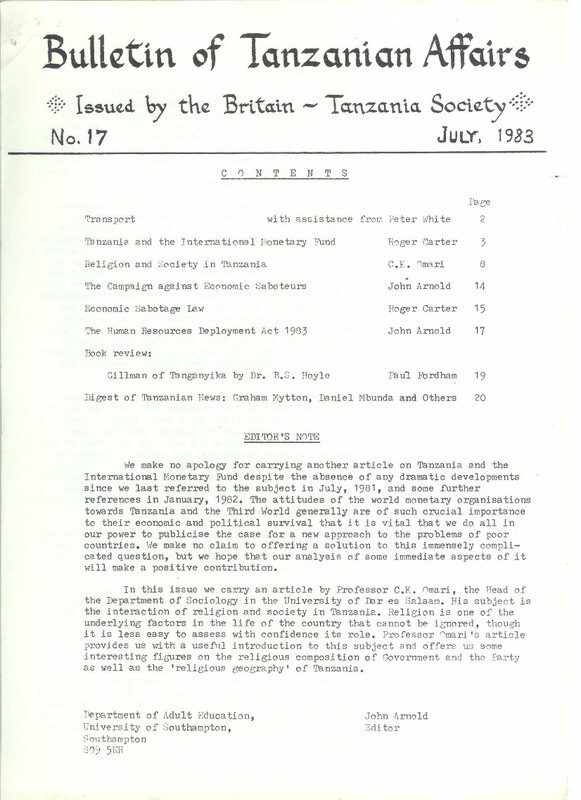 We make no apology for carrying another article on Tanzania and the International Monetary Fund despite the absence of any dramatic developments since we last referred to the subject in July, 1981, and some further references in January, 1982. The attitudes of the world monetary organisations towards Tanzania and the Third World generally are of such crucial importance to their economic and political survival that it is vital that we do all in our power to publicise the case for a new approach to the problems of poor countries. We make no claim to offering a solution to this immensely complicated question, but we hope that our analysis of some immediate aspects of it will make a positive contribution. In this issue we carry an article by Professor C.K. Omari, the Head of the Department of Sociology in the University of Dar es Salaam. His subject is the interaction of religion and society in Tanzania. Religion is one of the underlying factors in the life of the country that cannot be ignored, though it is less easy to assess with confidence its role. Professor Omari’s article provides us with a useful introduction to this subject and offers us some interesting figures on the religious composition of Government and the party as well as the ‘religious geography’ of Tanzania. At a recent meeting the Southern Africa Transport Commission allocated most of its available funds for a programme of rehabilitation and expansion of the Tazara railway line, while the EEC is to provide 10 million dollars for a maintenance programme involving the relaying mechanically of rails and sleepers. Funds are also being sought for a 17 million dollar project to weld the bolted rail joints installed by the Chinese and 15 million dollars for the repair of 30 landslides along the line identified by Australian consultants. Sweden, several other European countries and Canada have expressed an interest in helping to finance the rehabilitation programme. The importance of the Tazara line has increased since the Mozambique Government has had difficulty in improving the rail links from Zambia to Maputo and Beira, partly because of the activities of dissident groups. In recent years Tazara has been operating at only a fraction of its full capacity of 2 million tonnes, carrying only about 700,000 tonnes a year. This has been due both to failures in the operation of the railway and to difficulties at Dar es Salaam port. Traffic over the line has been slowed by failures of the track, which may be due to the original design and construction, but are more likely to be the result of inadequate maintenance, a consequence of economies enforced by low revenues. In addition, there have been persistent troubles with the locomotives. The original Chinese-built locomotives are now being replaced by new ones from West Germany, which has provided finance for 14 of them, of which the first was handed over on 31st. May. These more powerful locomotives will be better able to work the steep sections of the line, where trains have at present to be double-headed’. The West German Government has begun talks on funding a further 11 locomotives. The congestion at Dar es Salaam port has been mentioned in previous numbers of the Bulletin (e.g. Bulletin No.7 of December 1975) and has limited its use and reduced traffic on the Tazara line. There have, however, been improvements in the operation of the port and the Burundi Government has announced that it is satisfied with its working and with the operation of the Central line. It has therefore removed the special tax which it imposed in 1979 to recover the cost of having to air-freight goods from Dar es Salaam. A group of Zambian exporters stated that they had been encouraged to continue to use Dar es Salaam port by the reduction in cases of theft. At the same time, however, Zambia is developing a route for moving copper to Mombasa which avoids Tanzania by using a ship on Lake Tanganyika. The Tanzanian Harbours Authority have disclosed plans for further major development of Dar es Salaam port by the conversion of berths nos.9, 10 and 11 for containers, building a container depot in Ubungo, setting up a grain silo and installing modern cargo handling equipment. Tanzania’s link to the south-west is across Lake Nyasa by the m.v. Songea. There has recently been sharp press criticism of a reported loss of Sh8.25 million by this vessel due to underutilisation. The Sunday News asked why, since it is an area with the worst transport problems, the ship is not working at full capacity. Were there no proper studies done when the ship was purchased in 1975, or is the potential cargo not being organised? In January the National Transport Corporation began to receive the first consignment of road vehicle rehabilitation kits, forming part of a programme financed by the EEC to rehabilitate 600 trucks and build 700 vehicle bodies. Meantime, the first stage of the British financed and built Makambako to Songea road is complete (Nakambako to Wino). Britain is providing a further shs.256 million for the second stage. The full length of 322kms. is expected to be finished late in 1985. Public transport in Dar es Salaam has been improved by the licensing of the hitherto illegal private buses (‘dala dala’). These are now allowed to operate on the Dar es Salaam Bus Company (UDA) routes by paying a licence fee. The private buses charge a flat rate of shs.5 as against the UDA fare of shs.1. In the first week of July it was reported that the Ulii had been forced to restrict its operations to the periods from 6 to 9 in the morning and noon to 6 in the evening due to shortage of fuel and the National Bus Company (KAMATA) suspended all its services from 29th. June. Supplies of diesel were expected to arrive in Dar es Salaam in the second week in July. The heavy vehicle assembly plant at Kibaha (35km. from Dar es Salaam) has officially been inaugurated by the Prime Minister. The plant was completed last year at a cost of shs.59 million land was built with technical assistance from SAAB of Sweden, which holds 10% of the shares, the rest being held by the Tanzania Automobile Manufacturing Company (TAMCO). The plant assembles Scania trucks from imported kits and has an annual capacity to assemble 1,200 vehicles, or up to 2,000 vehicles by working two shifts. The actual rate of production at present is about 350 per annum. The Leyland Albion assembly plant in Dar es Salaam is in greater difficulties and may have to suspend production because of its inability to obtain a foreign exchange allocation to buy supplies of components and doubts over the renewal of a British Export Credit Guarantee. There is a national shortage of Leyland spares, which will further threaten the already precarious national transport system. There has been a provisional agreement with Leyland Albion to become Tanzania’s partner in the establishment of a local four-wheel drive vehicle assembly plant, but Japanese motor companies are showing considerable interest and may be willing to offer a package on easy loan terms, which would be very attractive to Tanzania. Will this be another example of Britain’s failure to appreciate that aid to developing countries creates employment at home? Tanzania’s central problem is the shortage of foreign currency to pay for her imports. As a result of this shortage, industry cannot renew machinery, is starved of raw materials and is working at less than half capacity; transport is increasingly decrepit and cannot rely on supplies of petrol, tyres, or spare parts; agriculture is suffering from shortages of fertiliser and difficulties with the movement of crops; the University is desperately short of books; health services lack essential drugs and equipment; and administration is hampered by sheer difficulties of achievement. The shortage of these necessary foreign funds is caused by the greatly increased prices of imports, especially of oil, the low prices earned abroad by most exports and a flagging production of most export crops on which Tanzania mainly relies to pay for her imports. Apart from the continuing economic decline that this situation is causing, Tanzania is exposed to high inflation. The retail price index for wage earners based on a 1969 Household Budget Survey appears to be rising at about 25% per annum, but the true rate is difficult to measure owing to the fitful availability of some items and the existence of a black market. Increasing budget deficits caused by falling revenues and rising prices are one reason. Another potent cause is the high and increasing costs brought about by the deterioration of vehicles, roads and machinery and by low industrial activity. Fixed overheads have to be carried by a falling output, so prices have to go up. Un fortunately, the IMF is the victim of its own history. It is not, and was never intended to be, an organisation to promote Third World development. It was created in July, 1944, at Bretton Woods to prevent the world slipping back into the restrictive trade practices, which had done so much damage during the Great repression of the thirties. It was charged with the promotion of exchange stability and a multilateral system of payments and with providing resources under adequate safeguards to enable countries to correct maladjustments in their balance of payments without resort to damaging tariffs and other restrictive practices. Support for development was left to the World B3.nk, or the International Bank for Reconstruction and Development as it was properly called, and other international bodies. This division of labour had some justification in the context of the Fund’s industrial customers during the period of post-war reconstruction. Economies that pressed forward too fast and became over-heated could be restored to equilibrium by internal adjustments and the Fund was able to supply useful advice and interim support while it took place. There was no question of halting the general trend towards ‘reconstruction and development’. But the exchange problems of many Third World countries, including Tanzania, differ fundamentally from those of the industrial North. Whereas pressures on the exchanges of the industrial countries were largely the result of domestic policies and could be corrected by internal adjustments, the problems of Tanzania were triggered and largely caused by the impact of external influences, notably the eightfold increase in the price of oil, the fall in the prices paid for Tanzania’s exports and the general effects of the world recession. That Tanzania’s difficulties are predominantly the result of this strongly adverse external environment is clear from the fact that before 1974, and again between 1975 and 1978, Tanzania ,maintained a rate of growth both of food production and of the national product in excess of 4% a year,(4) while avoiding external imbalance, high rates of inflation and recurrent budget deficits. The idea that perverse internal policies were the main cause, which has recently become a favourite theme in the press, clearly cannot stand up to examination. There were, of course, serious shortcomings and mistakes, now acknowledged, in the handling of villagisation and other issues, which may have made matters worse, but it would be a travesty to assign to them the dominant cause of decline. It may be argued that the industrial countries have also suffered from the energy crisis and the recession. But in the context of her foreign exchanges external circumstances exercised a far more catastrophic influence on Tanzania’s frail economy than “,as the case with the countries of the North. This is well illustrated by the case of oil imports. In 1971, such imports took about 13% of the proceeds of Tanzania’s export sales, but by 1981 the proportion had risen to nearly 53%. And while the foreign exchange problems of the industrial economies can generally be corrected by a contraction of credit in the short term, the dislocation caused by external pressures on the foreign exchanges of Tanzania can only be remedied by an expansion of her export capacity in the medium and long term, involving changes in the entire pattern of the export sector. For this kind of development programme the IMF is unsuited. First, the duration of its facilities is too short. A reorganisation of the country’s exports calls for changes on many fronts and cannot be effected within one to three years. Secondly, the initial dislocation caused by the Fund’s drastic remedies provides a poor starting point for progress in the export sector. In the words of the second Brandt Report, the Fund ‘should recognise more fully that, especially in poorer and less adaptable countries, if unsatisfactory policies have been in operation over a period of years, they cannot often be ‘put right’ by sudden about-faces, drastic devaluations overnight and the like. Tanzania’s central problem is not a simple matter of monetary adjustment, but of export growth. Tanzania has to face the world as it is, with its high cost of energy and industrial imports. It can only accommodate itself to this situation by increasing substantially its income from exports. It is, therefore, of great importance not only that the Fund should not impose on Tanzania burdens that will impede export recovery, but that a Fund facility should be quickly followed by a Structural Adjustment Loan and other facilities from the World Bank, for the most part on concessional terms. Tanzania is among the least developed countries that have to rely almost entirely on earnings from the export of a narrow range of agricultural products. Demand has been flagging during the recession and global over-supply has led in many cases to serious falls in price. Tanzania’s immediate prospects, therefore, depend to a great extent on general recovery from the recession, though a production and export drive might enable Tanzania to recover ground lost to her competitors, or even to improve her relative position as a supplier. But in the longer term progress depends on the prospects for diversification. This will not be easy and industrial growth of the kind enjoyed by Korea, Taiwan and Brazil must be regarded as still a long way away. But there are some possibilities that are emerging. The first is a large paper plant at Sao Hill, which is due to be completed late in 1984, or early in 1985. A second is the exploitation of natural gas from Songo Songo and elsewhere on the Tanzanian coast. The product is urea and ammonia, which will not only save import costs for nitrogenous fertilisers, but ”fill also provide a valuable export commodity. Taken together, exports of paper, urea and ammonia should by the late nineteen eighties total 200 million dollars, which may be compared with the recent annual exports of coffee for 150 million dollars. Tourism could become an appreciable earner of foreign exchange if conditions conducive to its development could be created. But fundamental though such developments are for the solution of Tanzania’s foreign exchange problems, they are not amenable to promotion by the IMF. It is, therefore, of added importance that the respite afforded by the IMF should not impair Tanzania’s ability to respond with vigour to such possibilities. In order to reduce inflation, the Fund recommends the abandonment of food subsidies to relieve pressure on the budget. Since early in 1980 Tanzania has removed subsidies on all foodstuffs except the staple sembe (maize meal) and with this exception prices are now at full cost with a 5% profit margin for the marketing bodies. There is also agreement in principle for the progressive reduction over three years of the subsidy on sembe . But the saving for the budget would be only marginal. At present the sembe subsidy costs the Treasury about shs.250 million, or 1.5% of total expenditure and further costs are offset against a special tax on sugar. Sembe now sells at shs.2-50 for a kilo in the official market: the IMF recommends an increase to between shs.8 and shs.11-50 a kilo. So drastic an increase would, however, cause grave destitution among urban consumers and the danger of civil disturbance unless a comparable increase in the minimum wage could be arranged. The IMF suggest an increase of 15% in the minimum wage, which contrasts starkly with its own estimate of a 50% rise in the cost of living resulting from the adoption of its programme and alternative official and independent estimates of 130 to 150%. In many developing countries the conflict of interest between the farmer and the urban consumer cannot be bridged without intervention and various measures have been adopted by governments to mitigate gross urban poverty. The World Bank has considered a number of these and has recognised that food subsidies ‘are frequently the most effective way of reducing calorie and protein deficiencies among the poor who buy food, especially those in urban areas, and involve fewer administrative burdens than other fiscal outlays. (8) It seems essential that in relation to the sembe subsidy the Fund should leave it to the Government to decide what is equitable and politically possible and should not drive it to adopt measures that could cause grave destitution and foment riot, as has happened in Egypt, Sudan and elsewhere. That agreement with the IMF is essential to Tanzania there is little room for doubt. But while the protracted dialogue 2ith the Fund has not been all counterproductive, the Fund still seems preoccupied with its traditional financial and fiscal devices without sufficient regard for the conditions necessary for export recovery. Mere reliance on money incentives for producers, important though they are, is a misreading of the Tanzanian situation. For the rehabilitation of key consumer goods industries is also essential if money incentives are to provide a real stimulus for exports and not merely to fuel inflation. But the Fund gives the impression of overlooking this when by its policy of drastic devaluation it merely places an added burden on these industries. The rehabilitation of the Tanzanian economy is much more complicated than that. On the Tanzanian side a substantially greater measure of devaluation now seems inescapable, though not necessarily in the same manner or degree as demanded by the IMF; that remains to be negotiated. Equally important are the safeguards against unwelcome side-effects either on export potential, or on minimum urban living standards. The context of consultation with the Fund must be a careful disavowal of ideological dictation and a recognition that the basic laws of economics are a reflection of human nature and that though they can often be adapted to serve general policy objectives, they cannot be ignored. The Fund’s guidelines of 1979 themselves allow room for such modifications of the impact of economic forces as will have ‘due regard to the domestic , social and political objectives of member countries.’ This means that Tanzania’s endeavours to create a more equal society and to promote responsible human cooperation must be respected. (2) According to the Minister of Finance in his budget speech of 16th. June, 1983, Tanzania needs Sh8.5,000 million a year for three to five years from external sources to rehabilitate the economy, pay off all external intergovernmental and commercial debts, re-equip industry and finance important projects for the expansion and reinforcement of the economy. (4) World Bank statistics show an average growth rate of GDP of 5% between 1970 and 1978, the sixth highest among the 38 lowest income countries : World Development Report, 1980. (6) The IMF is asking for a devaluation from shs.9.7 to the dollar to between shs.25 and shs.35. On 3rd. June, Tanzania devalued the shilling by 20%, bringing its value to shs.12.2 to the dollar. (7) The IMF propose a rise in producer prices for food crops of 25% and envisage passing on a considerable part of this to the consumer, who would suffer severely. The impact of the HIP proposals on inflation is estimated by them to be a 50% rise in the cost of living index, but the Bank of Tanzania and others calculate that the figure will be much nearer to 130 – 150%. (8) World Development Report, 1981 : The World Bank: p. 106. On 25th. March, 1983, the Government launched a series of raids and arrests of people thought to be profiting from the country’s economic difficulties by hoarding scarce commodities and illegal trading. News of arrests and of goods confiscated was published in successive editions of the press. On 5th. April President Nyerere made a speech in which he explained the reasons for the operation and asked for public cooperation. He warned that the Party should not attempt to shield people involved in profiteering. Complaints about hoarding had been growing over the past three years (see Bulletin No.13 concerning the sugar shortage) and popular pressure had been mounting for some firm Government action. The action appeared to attract general public approval and on 28th. July he felt obliged to assure a meeting of Government, Party and parastatal leaders that the campaign would not be slackened. In the early days of the campaign considerable illegal hoards were uncovered, including a large warehouse of motor spares which had been virtually unobtainable through normal channels and large quantities of basic foods such as cooking oil and salt, which had been in short supply. An immediate, though it must be said a short-lived, effect of the raids was the appearance in the shops of items such as radio batteries, which latterly had been virtually unobtainable. This must have been due to the exemplary effect of the campaign, since confiscated hoards at that stage were held under lock and key pending hearings by the Tribunal and not offloaded on the market. Some goods were found buried, or just abandoned. The President announced that people who voluntarily surrendered to the authorities goods obtained illegally would be pardoned, an indemnity that was later incorporated in the law. In response to this announcement goods worth millions of shillings were handed in. The raids had been planned in a way which identified Government officials who had collaborated with, or connived at, illegal business operations and those subsequently dismissed from office included two Regional Commissioners (one subsequently pardoned, though not reinstated), two Regional Police Commanders, two General Managers of Regional Trading Companies, a Regional Education Officer and three Area Commissioners. At the end of April it was reported that a total of 1057 people had been detained and shs.33 million in cash had been seized. The amount of cash being held outside the banks is perhaps the best evidence of the existence of illegal dealings, but there was also pressure on legitimate businesses to hold large amounts of cash because Regional Trading Companies, Government Licensing Offices and other public bodies had been refusing to accept cheques. The President has instructed that this practice be stopped. Nobody in Tanzania seriously expects that illegal dealings detrimental to the economy can be stopped by draconian measures alone. Such practices, which result from attempts by individuals to make up for shortages and in the crasser cases to make money out of them, can only be brought to an end when market supplies are again adequate. But Tanzania has no choice in this matter. The restoration of supplies poses formidable problems in present world conditions and is unlikely to be achieved in the near future. Meantime, the diversion of goods from the official market for purposes of private gain has detrimental effects on the economy and, what is perhaps equally important, brings Tanzania’s good name for honest dealing into disrepute. From the public’s point of view, the release on to the market of hoarded goods can bring only momentary alleviation of current shortages. But the removal of corrupt officials from government offices and trading organisations, who have used the advantages of office for personal gain, must do something to restore the reputation for probity that Tanzania once enjoyed. The integrative influence of religion in society varies considerably depending on the historical context and the situation in which individual members find themselves. The importance of religions in society and the role they play cannot be ignored, given what is happening in Northern Ireland, Iran and the Middle East. The need to examine the relationship between ideology (political) and the religious belief systems is called for. Theories on the integrative aspect of religious life show that (Parson 1951) where there are social and economic problems there is a tendency to legitimise values for the purpose of solving those problems. Such values may be manifest in group form, or among individuals. For example, where the ideology of the country emphasises the collective nature of socio-economic development, religious institutions are also likely to support communal undertakings for the benefit of all the people rather than encourage individuals to work in isolation. In a more individualist society, like in the West, where individual economic and political entrepreneurship are highly valued, religious institutions are likely to emphasise the individual relationship between man and the supernatural being, while societal progress is looked at as a reward of such a relationship. Such explanations go back to Weberian theory on the relationship between religion and economic development (Weber 1930). This states, among others, that an individual’s belief system helps to shape his actions and relationships in society. It is easy to have such a situation where we have one predominant religion. But in a society like Tanzania, where we have more than one major religion, to delineate the aspects of these religions and show how each individual carries his belief system beyond the institution is rather an interesting exercise. Tanzania claims to have a harmonious relation among her religious groups, while these religions groups as well as individual members are contributing to the socio-economic development of society. From the beginning of Tanzanian independence, political parties based on religious group factions were discouraged. This was in a bid to curb divisions which might have disrupted the political unity and integration which Nyerere was aiming at. He guided his political party in a secular manner, which allowed individuals to participate fully regardless of their background. The party was inter-religious, inter-ethnic and inter-racial in its nature. Although religion is not the basis for political participation in Tanzania, individual belief systems shape the individual’s contribution to the socio-economic development of the country. Individuals meet at political rallies, economic organisations, social gatherings to discuss matters of mutual interest with their religious background. In this way some kind of influence on the directions and relationship among the different religions may be dictated by this background. In some parts of the world such religious backgrounds have led to conflicts among the various religions existing in society. The Tanzanian scene gives a rather interesting picture of a harmonious relationship between various religions in spite of the fact that these have different and opposed belief systems. The aim of this short paper is to look into the extent different religious groups live and participate harmoniously in the socio-economic development of the country. The paper carries a sociological interpretation in its presentation. Tanzania is a secular state. She does not uphold any of the existing religions in the country as a state religion. Yet Tanzania respects religions very much. Individual citizens who interact among themselves in their daily lives are members of various religious groups, as it will be presented in this paper. The Tanzanian position and attitude towards religions is embodied in both Party and Government official documents. For example, the National Anthem starts by evoking God to bless Africa and Tanzania in particular. The National Assembly (Par1iament) starts its sessions with prayers and the Party constitution guarantees religious freedom (Omari 1976). There are no accurate statistics on religious groups in the country. Since 1967, when the national census had questions on religion, the religious question has been played down purposely in other information-seeking documents. We have, however, some est1mates which can give us a rough picture of the religious situation in the country. The official reports on the distribution of religions in Tanzania show that the three major religions, Christianity, Islam and Traditional Religions make up 30% each. The remaining 10% belong to other religions like Hindu, Shinto and other minority groups. Such statistics can be disputed, for they have been given for convenience sake. On the other hand, we have David Parrett in the World Christian Encyclopaedia, who estimates that there are 44% Christians; 33% Muslims and 23% Traditional Religions. Perhaps it is correct to say that statistics among Christians are more correct, for these are used to keep up the records of their memberships accurately, than it is for other religious groups where it remains an estimate only. As it can be noted below in Table 1, only the figures for 1967 can give us some indication with regard to religious distribution accurately, for in the 1978 census the religious question was removed from the questionnaire for reasons known to those concerned. At that time (1967) in mainland Tanzania, out of 12 million people, the majority were Traditional. However in the urban centres, the Muslims were in the majority, (a phenomenon which shows religious geography in the country). The religious groups geographical distribution in Tanzania can be said to be spread all over the country. However, some differences exist. For example, the majority of Muslims are found around the coast areas, Zanzibar and the slave trade corridor, which includes Bagamoyo, Tabora and Kigoma – Uvinza. As it can be noted in the above Table I, Regions like Coast (including Dar es Salaam), Mtwara and Tanga are predominantly Muslim while in Regions like Kagera (West Lake), Kilimanjaro and Ruvuma, Christians are in the majority. The figures for the Muslims also can be questioned, for there is a tendency among many Tanzanians of having Muslim names without being Muslim. Among the coastal people for example, you will hear someone called Mohamed who hardly knows where the mosque is! With the coming of secularism into Tanzanian society, such a tendency is getting into Christians as well. For the traditionlists, since they vary from one ethnic group to another, the way to identify them is by elimination. If someone does not belong to the major religions and lives in rural areas, he very definitely belongs to Traditional Religion. Researchers and scholars like Barrett (1072), van Bergen (1981) and Westerlund (1980) have made studies of the religious scene in Tanzania, especially in relation to social development and have been at pains to produce some interesting statistics on the religious groups. It is very interesting to note that although the statistics are not that reliable, the contribution of religious groups to socio-economic development of the country is significant and is acknowledged fully by both the Party and the Government. The contribution of religious groups towards socio-economic development in the country is a positive response to President Nyerere’s call for all religious and non-government agencies to contribute towards the process of building a just and equitable Tanzanian society. Ever since Tanzania decided to follow the Ujamaa-socialism path of socio-economic development in 1967, it has been a chal1enee to various religious groups to come out with various contributions and support in the endeavour to build that kind of society. Both Van Bergen and Westerlund in their studies have shown that from the beginning almost all organised religious groups accepted the national ideology, though in some parts with some reservations. Their reservation is centred around ujamaa being equated with communism, an ideology which has had some conflict with religion in other parts of the world. As far as I can see, their fear is rooted in two basic points: one, the historical development of socialism in many of the Western and Eastern countries in relation to religion has been very antagonistic. Such experiences are known among the Christians through their friends and other Christians who are living in those countries where such experiences are happening. Two, some of the politicians, especially right after the Arusha Declaration in 1967 and in the early seventies did speak against some religious groups like Christians. Their opposition to Christianity was based on the historical relation which exists between Christianity and Western capitalist ideology. On many occasions, Nyerere himself a Christian had to explain to the Church leaders and the general masses the position of the Party and Government in general with regard to the role of religion in Tanzania. Today we can say that many religious groups in Tanzania are in the forefront of the social development process in Tanzania. As it can be noted in Table II below, the example of the Christian Council of Tanzania in mobilising resources for community development is magnificent. A lot of money has been spent on projects like water, health and other activities which enhance people’s level of social development. I am sure, if deep studies were made in other religious groups, we could find out their contributions like the one through the Christian Council. My quick observation is that organisations like the Tanzania Episcopal Conference for the Homan Catholics and Bakwata ta for the Muslims have mobilised a lot of resources for socio-economic development in Tanzanian society regardless of the differences in the belief systems of the recipients. When all religious groups have realised their potentiality and utilised it fully, Tanzania will have taken heed of the call of President Nyerere to become partners in social development and the concept of “play your part” will have become more pragmatic and concrete. Source: Christian Council of Tanzania 1983. The Christian Council of Tanzania, which represents almost all non-Roman Catholic Christians in the country, mobilises resources both externally and internally for the approved projects. Basically, the projects must be community-oriented with the marginalised and poor groups as the beneficiaries. As such, most of the projects supported by the Christian Council are rural-oriented ones where the majority of the population live. Table II above reveals other factors as well which I would like to mention. Since the Christian Council acts as a clearing house and a mobilising group for only those projects passed through its office, there is no effort made to trace other resources mobilised by other religious groups for the same purposes. It serves, however, as a good example of how a religious group can work as a pressure group as well as mobilising force for community development. The figures above are only for two years and for the selected projects only. Not only various religious groups participate in socio-economic development through mobilisation of resources and services, but individuals participate fully in various socio-economic activities in their different roles. This is very important, for some of the civil servants and politicians exemplify their different belief systems through their deeds even though they are in a secular state. There are common ethical elements which are generally found in all religions. Tanzanian national ethics as embodied in the national ideology has taken into consideration the major teachings of various religions as related to the secular state. In this way, one can say that the Tanzanian way of handling religious beliefs in socio-economic development is through incorporation and integration rather than identification and isolation. All individual religious groups as well as individual citizens are called upon to participate fully in the national socio-economic process itself regardless of their religious background. Thus candidacy in local and national political posts and participation is based primarily on a national and individual ability rather than religious affiliation. One could argue, then, that Weberian theory of religions and society could help us to understand Tanzanian political development in relation to the individual beliefs in the society. Among other points, this states that belief systems which individuals hold helps to shape and generate principles which assist socio-economic development. In Tanzania, it could be argued that individual members come out to participate in socio-economic development of the country having party ideology as a unifying factor while at the same time holding to the personal faith without necessarily compromising it. Table III: Composition of the high office in Tanzania according to religious background as at 1976. With a quick glance at Table III above one gets an interesting picture. Up to 1975, when I made a general survey of the religious background of the various selected individual members holding high offices, almost all major religions were represented. These individuals came to these offices not by virtue of their religious background but by virtue of their ability. The parliamentarians are elected by the people at local level and usually the election manifesto is based on party ideology rather than religious faith. Of course, where one religious group is predominant, like Zanzibar, one expects Muslims to be the majority in any election. In this case, out of 172 Members of Parliament during that year, 35 were from Zanzibar and all were Muslims. The high number of Christian Ministers and the low number of Christians in the Central Committee is a reflection of educational background as related to the aspirations and interests of individuals rather than the religious variable per se. Many more Christians have been educated and trained in various technical and leadership posts than their counterparts the Muslims. This is an historical phenomenon rather than any deliberate policy (Omari 1976, van Bergen 1981, Westerlund 1980). On the other hand, Muslims found the political posts as the chance for them to balance the uneven participation in the political development of Tanzania. Thus many Party functionaries at district and local level are generally with low level of educational background and have been Muslims instead of Christians while the administrative and bureaucratic offices have been filled mainly by Christians. In spite of these marked differences of educational background among the members of different religious groups at the high echelon, the harmonious relationship that exists between different members of Tanzanian society is very high. People tend to think of Tanzania first in ethnic terms rather than in terms of religion in their participation in socio-political matters. This does not mean, as I argued above, that individual faith is ignored. It is treated as a private matter which can contribute to the well-being of all the people on the principles of justice and equality for all. Religious faith is thus subordinated to the common social objectives as described in the Party ideology of Ujamaa and self-reliance. This aspect of the religious contribution to the Tanzania Socio-political life is enhanced by the fact that the President of the Republic and his Vice-President are people of religious conviction who participate in both political and religious life. Their lives have been a shining example to the public. Towards Civil Religion – Conclusion. Above I mentioned about the National Anthem as having a religious context. It is also interesting to note that at the beginning of every sitting of Parliament, there is a general prayer. Some few people, within the Party and outside, especially those who profess not to belong to any of the organised religions, privately have been raising some questions with regard to such procedures. Yet as I see it, Tanzanian society as it stands today, with its democratic system, their views will not change the present procedure both in Parliament sittings and in the National anthem. At Party meetings, however, it is the Party ideology which is the guiding and driving force; hence some phrases are said at the beginning of the meeting, sometimes rhetorically. It can then be said that Tanzania is one of the countries of the World which has decided not to have a state religion, yet recognises and utilises religions for the social development process. In this way both the Party and Government depend very much on the individual contribution to the social development of the country. On their part, the Party and Government have ensured the freedom of working for all citizens. It is part and parcel of the human right and has been enshrined in Government law and constitution. In conclusion, this paper has been an attempt to present briefly the religious scenery and its contribution to Tanzanian society. The role of religion in society has been presented with Weberian theoretical background. Individual members of different religious groups as well as organised religions like Christianity and Islam have been looked at more closely than the traditional religion. This has been done purposely for the sake of brevity. Barrett, D.B. Frontier situations for Evangelisation in Africa 1972: A Survey Report. Nairobi. 1972. Weber, M. The Protestant Ethic and the Spirit of Capitalism: (trans. T. Persons). London: Allen and Unwin 1930. Westerlund, D. Ujamaa na Dini. Stockholm 1980. The Government has long been aware of losses to Tanzania’s beleaguered economy caused by the illegal activities of hoarders, black market dealers and foreign exchange manipulators. The side-tracking of scarce consumer items into private hoards with a view to profitable sale in the black market, when discovered, has aroused great public indignation at a time of grave difficulty and shortages. Yet the normal processes of the law have appeared unable to deal effectively with such crimes and hearings were often subject to serious delays and repeated ‘mention’ before magistrates. In the event, it appeared to the Government necessary to introduce a temporary emergency procedure for dealing with such cases. Action against economic saboteurs was started on 25th. March, 1983, and appears to have been taken initially under the terms of the Preventive Detention Act, but it soon received retroactive cover under the Economic Sabotage (Special Provisions) Act, 1983, which became law on 4th. May. The original intention was to try cases of economic sabotage before a special advisory tribunal, leaving the final decision to the President, but parliament (Bunge) insisted that the Tribunal should pronounce a final verdict, leaving to the President the determination of appeals against sentence, but not against conviction. The Act was brought into force by Presidential Order with retroactive effect to 25th. March, 1983, and remained in force for twelve months from that date, after which the President might extend it for a further six months. Any extensions beyond that period would require a resolution of Bunge. The whole body of legislation thus wore the appearance of temporary shock treatment. The Presidential Order confined the operation of the Act to Mainland Tanzania. The Act was subsequently amended on 2nd. July by the Economic Sabotage (Special Provisions)(Amendment) Act 1983. Many of the amendments were for clarification, but certain changes of substance were introduced. Some of these have the effect of further limiting Presidentia1 discretion. The President’s power to order release on bail and the right of appeal to the President against sentence have disappeared. The Presidential power to act on any recommendation made to him by the Tribunal as he may deem fair and just is also withdrawn. The number of scheduled offences to which this legislation applies, is increased from 8 to 21. All of the scheduled offences were created by various existing laws, but removed from the jurisdiction of the courts , during the currency of the Act, except in cases to which the Act does not apply (see below). Thus, the definition of the various economic sabotage offences is to be found in the appropriate statutes. However, a written Laws (Miscellaneous Amendments) (No.2) Act, 1983, became law on 2nd. July with retroactive effect to 24th. March and extended the definition of the scheduled offence of hoarding in the Penal Code and also added to the Regulation of Trade Act, 1980, a section dealing with the improper disposal of certain goods by any person in the Party, in Government, or in any parastatal organisation. One interesting innovation in the amending Act is the authorisation of evidence on affirmation as well as on oath. A revised Order bringing the Act into operation contains two innovations. First, drawing on his discretion to apply the Act to such persons or category, of offences as may be specified in the Order, the President ruled that the Minister for Home Affairs might direct that in serious cases the charges should be dealt with under the Criminal Procedure Code, or ‘any other written laws’. This appears to mean that there are to be three categories of economic sabotage offences. Serious charges against civil servants can be dealt with under the disciplinary procedures for the public service. Other very serious cases can be handled by the courts in the normal manner, leaving the less serious cases to come before the Tribunal. The decision rests with the Minister after considering the evidence submitted by the Inspector General of Police and it is not yet known what advantage will be taken of this discretion. The other interesting provision made in the Order indemnifies anyone who on or after 5th. April, 1983, voluntarily surrenders all goods, money, or foreign exchange which are held in contravention of the law relating to economic sabotage offences. Cases are to be tried by a Tribunal presided over by a High Court Judge appointed by the President sitting with two other members also appointed by the President. Decisions may be by a majority of the Tribunal, which appears to mean that the presiding judge could be overruled by the other members. Sentences may be for a period of detention not exceeding 15 years and the Tribunal may make orders relating to the settlement during sentence of the person convicted and to the disposal of the property to which the offence relates by forfeiture to the United Republic. Prosecutions are brought by Police Public Prosecutors under the direction of the Director of Public Prosecutions and the proceedings of the Tribunal are to be regarded as judicial proceedings. Thus, false testimony, wilful misrepresentation by an interpreter, or the fabrication or destruction of evidence, are punishable at law and may lead to imprisonment for seven years. The proceedings of the Tribunal are to be in public unless the premises are too small, or unless at any particular stage the Tribunal, or the prosecution, decides that proceedings should be in camera. The final judgment, however, must be given in public. The procedure of the Tribunal is precisely laid down in Regulations. The decisions of the Tribunal are to be taken solely on the facts before it and if the Tribunal considers that the facts have not been proved it must acquit the accused. The order of proceedings, the calling by the Tribunal and the interrogation by either side, or by the Tribunal, of witnesses, the power of subpoena, the requirement of evidence on oath or affirmation and the burden of proof resting with the prosecution, except where any law otherwise provides, are practices which in general are identical with those of the courts. 8vidence must be given in the presence of the accused and taken down in writing by the Tribunal. Each witness must be informed that he is entitled to have his evidence read over to him in a language that he understands and any comments he makes must also be recorded. Evidence given in a language not understood by the accused must be interpreted to him. The Act expressly allows the collection by the Tribunal of information whether or not it is evidence within the meaning of the law applicable in the courts. Nevertheless, the Tribunal is bound by certain rules of evidence, which so far as they go are similar to those of the courts. The Tribunal must be satisfied that the person is guilty. Confessions obtained by threat, violence, or the promise of immunity are inadmissible as evidence. The testimony of interested parties is not admitted. The accused is not compelled to give evidence in his own defence, though he is entitled to do so and to call witnesses. All evidence must be on oath or affirmation. Perjury, false evidence, or the presentation of false documents, is punishable by a fine not exceeding shs.50,000, or three years in prison, or both. There are detailed rules governing investigation and arrest of suspects by the police. Where there are reasonable grounds for believing that an offence has been committed, a search order may be issued by the police officer in charge of an area. Arrest requires prior authorisation in the form of a warrant issued by a police officer in charge of an area, police station, or post, unless it is believed that the accused person might escape, or destroy evidence. It is for the police officer in charge of an area to decide whether there are prima facie grounds for proceedings and whether the accused should be temporarily confined for purposes of investigation. A police officer in charge of an area may also release the accused pending investigation on such conditions as are necessary, including the execution of a bond with sureties. If the police officer in charge of an area decides that the evidence does not warrant prosecution, he must release the accused forthwith. A formal charge may be made by any police officer. However, the regulations suggest that the prior approval of the Inspector-General of Police is necessary and that the Inspector-General must thereupon apply to the Minister for Home Affairs for a confinement order authorising detention until the proceedings before the Tribunal have been completed. The Director of Public Prosecutions may give directions in writing to the Inspector-General, or to any other person involved in the proceedings. A study of this legislation shows that care has been taken to safeguard the fairness of proceedings and avoid the misuse of powers for unworthy purposes, such as the satisfaction of a personal grudge. If faithfully carried out, the procedures laid down should effectively provide for the establishment of guilt and the release of those against whom guilt cannot be proved. It would be quite wrong, therefore, to conclude that basic human rights are ipso facto in jeopardy. But alas! no Tribunal and no police officer is perfect and what is sadly Lacking – indeed expressly excluded by statute – is any remedy where justice miscarries. There is no appeal against conviction or sentence and no civil or criminal prosecution is possible against the Tribunal, or its servants, or any police officer, except on grounds of exceeding their authority, or acting with ‘undue negligence’. Further, legal representation of the accused before the Tribunal is forbidden by law. He has to conduct his own defence and name his own witnesses. The Government has no wish to see a guilty person found not guilty on account of a technicality and indeed if the police bring the wrong charge the Tribunal has power to alter the charge. But it is also important that the innocent should not be found guilty on account of an inadequate defence. The risk of miscarriage on legal grounds is increased by the majority rule, which makes it possible for the presiding High Court Judge to be overruled by his two non-legal colleagues. Many of these defects would be remedied by the institution of an Appeal Tribunal, perhaps under a Judge of the Court of Appeal, without disturbing the existing machinery. The Human Resources Deployment Act, 1983, was passed by the National Assembly in April and became law on 9th. May. It gives the Government wide new powers to mobilise the country’s labour force for productive work. It follows a direction of the National Conference of the Party (Chama cha Mapinduzi) held in October, 1982, that the Government ensure that everybody who is able to work does so more skilfully and productively. The Act is ‘aimed at making provisions to regulate and facilitate the deployment of available human resources towards the eradication of poverty’. The preamble to the Act refers to the Constitution of the Republic, the Arusha Declaration and resolutions of the former Tanganyika African National Union and of CCM concerning the right and duty of citizens to engage in productive and lawful work. The Minister for Labour, after consulting other Departments and public and private bodies, is required to produce a National Human Resources Deployment Scheme involving public and private sectors and agriculture to ensure that all residents capable of working do so more skilfully and productively. The Act also sets up a National Human Resources Advisory Committee appointed by the Minister for Labour to advise on the implementation of policy, on research into better ways of using available manpower resources and on any necessary legislation. The Act makes the new local authorities responsible for making arrangements which will ensure that every resident within its area ‘engages in productive or other lawful employment’. All local authorities are required to establish a local human resources deployment committee to carry out the provisions of the Act and will have the assistance of a local co-ordinator appointed by the Commissioner for Labour. In addition to formulating plans for employment- generating projects, local authorities will maintain two registers. There will be an Employers’ Register, which will give information on employment capable of being offered by employers. There will also be a register of all ‘residents’, that is, people who ordinarily reside in the area of the authority excluding those under the age of 15 and those incapable of work on account of old age, illness, or infirmity, with details among other things of their qualifications and present employment. The Commissioner for Labour in conjunction with employers in the public and private sectors will establish a national register of non-skilled, skilled and high-level manpower. The Minister may make regulations as to the manner in which the inclusion of a person’s name on the register may be proved, for example, by the issue of identification cards. The Minister may arrange for the transfer and subsequent employment of unemployed people, having special regard for retired public servants, unemployed young persons, unemployed adults, housewives and non-citizens. Where training or rehabilitation is needed, the Minister in cooperation with other Departments may make provision for suitable courses. The Minister is especially required to provide for the rehabilitation and gainful employment of persons convicted as ‘idle and disorderly persons’ (prostitutes, beggars, gamblers, vagrants, etc. ), or as ‘rogues and vagabonds’ (petty thieves, idle and disorderly persons on second conviction). The officers of the Commissioner are empowered to enter premises ‘reasonably suspected of harbouring idle persons’. It will be an offence to obstruct any scheme organised under this Act. The Act appears to reflect the conviction long held and expressed in the Arusha Declaration and subsequent statements that the nation’s human resources are one its principal assets. The more effective use of manpower has become even more critical in recent years owing to the decline in the nation’s economy and restrictions in the flow of external resources. If in the present unfavourable international climate the nation cannot develop the economy as previously planned, at least it must make the best possible productive use of the two factors of production that are available in abundance – its human capital and its land. It is a recognition of this fact that is believed to have led to this legislation. There are of course symptoms of maladjustment in the use made of human resources, which are mainly a consequence of the economic crisis. There are persons who have been devoting their energies to black market activities and other occupations that are parasitic on the economy in an effort to bypass shortages and to manipulate the situation for personal enrichment. There is also the pervasive and unsolved problem of the urban unemployed, rural folk who drift into the towns in the, belief that the streets are paved with gold. There are finally those retired civil servants – one hopes few in number – who use their knowledge of the ropes and a little greasing of palms to secure special favours. Some of these aberrations are punishable at law under the Economic Sabotage (Special Provisions) Act, but the Human Resources Deployment Act is a much more positive approach to such problems. It is interesting that special attention is given by the Act to employment schemes as a therapy for petty crime. Whether the new local authorities will measure up to this formidable challenge remains to be seen. Even labour-intensive employment requires an investment both of capital and of initiative and expertise; only the future can show whether these essential ingredients are available in sufficient measure, though the comparative success of the Small Industries Development Organisation (SIDO) even under difficult economic conditions is a hopeful sign. One interesting aspect will be the use made of the services of the growing body of civil servants retiring at 55, or resigning at 50, as the law provides. The hope is that many will return to their villages and provide a focal point for new initiatives in rural society. The first test will be in the Dar es Salaam Region, where the Prime Minister has directed that the Region identify farming land for the unemployed of the city. This is potentially a substantial task. It is calculated that of the city’s estimated population (1983) of 1.3 million only 166,000 (12%) are formally employed. On the assumption that on an average they have four dependents, this accounts for 830,000 people, leaving an estimated 470,000 engaged in the informal sector or unemployed. Clearly nothing like this number will need to be resettled. Studies both of Tanzanian and of other African urban areas (1) have demonstrated that the informal employment sector is complex and dynamic, making an important contribution to the economy. The Tanzanian Government would not want in practice to remove this source of initiative and enterprise. However, there is understandable worry at the demands that Dar es Salaam makes on the national food supply and both employed and unemployed residents are being urged to make efforts to grow at least part of their food requirements. The Government will offer farm implements and seed for sale, or on easy credit terms, and provide food for a short period for people who are prepared to settle in and farm the new land. Contextual Perspectives on Geographical Thought: Gillman of Tanganyika (1882-1946) by Dr. B.C. 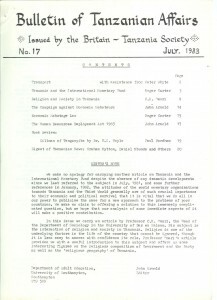 Hoyle: Discussion Paper no.19, Department of Geography, University of Southampton, 1983: 25pp. : 75p. This short paper is intended to be the forerunner of a major study of Clement Gillman’s life and work. Engineer, cosmopolitan, explorer and practical geographer par excellence, Gillman’s 40 years of scientific exploration and practical administration span the whole period of the modern development of Tanganyika to the end of World War Two. He was particularly associated with railway development, but his pervasive interests in hydrology and environmental issues placed him in the front rank of those who both contributed to and drew intellectual support from the newly developing field of academic geography. In late January, Zambian and Kenyan newspapers carried reports of an attempted coup in Tanzania. It was alleged that there had been fighting in a northern garrison town and that 600 soldiers and 1,000 civilians were under arrest. These stories followed earlier reports of bandit activity on the shores of lake Victoria involving the ambushing of an army patrol. Such reports were described as greatly exaggerated by the Inspector-General of Police. On 28th. January, 29 people appeared in court charged with conspiring to overthrow the Government by force and kill the President. The accused included Christopher Ngaiza, a personal assistant to the President responsible for the Kagera Basin Project; 14 army officers ranging in rank from lieutenant to lieutenant-colonel; a university lecturer; and several business men. The prosecution seemed to have some difficulty is preparing its case, as there were repeated requests for adjournment. However, by the second week in June the prosecution was claiming that investigations had reached an advanced stage and that they would be ready to open the preliminary enquiry before a magistrate by the end of the month. The Government then took a decision to abandon the prosecution and it was reported that the accused people would be held in preventive detention. On 17th. June two of those being held in maximum security, Pius Lugangila, a business man, and Hatty Naghee, a former pilot with Air Tanzania, escaped. As a consequence, the Minister for Home Affairs and the Director of Prisons resigned their posts. Amendments to the Constitution, which have been put forward for public discussion, include limiting the number of terms a President can serve, the creation of a Second Vice-President (one being for mainland Tanzania and the second for Zanzibar and the islands) and increasing the powers of the National Assembly. The system of appointments in public institutions is to be modified. These posts will in future be advertised and the Board of the organisation together with the parent Ministry will make recommendations to the President, who will make the final decision. The Department for the Civil Service and Manpower Development, which was previously part of the Prime Minister’s Office, has been made into a separate Ministry headed by Pius Mwandu. Executive Directors have been appointed for the 80 new District Councils wh1ch are to be established later this year. Councils will be responsible for the provision and maintenance of economic infrastructure, social services and revenue collection. The separation of Government and Party means that the senior civil servant in a District again has the title of District Commiss1oner. The future responsibilities of District Councils under the Human Resources Deployment Act 1983 have already been noted on page 12 (above). Cooperative Societies which were abolished in 1976 are to be re-established together with Cooperative Unions at Regional level. In addition to marketing crops, the Cooperatives will have responsibility for promoting agricultural production. They will do this through the supply of farm inputs and the provision of credit. In a recent speech, opening the Third Conference of Financial Institutions, President Nyerere pointed out that in the last year in which Cooperatives were acting as credit intermediaries roughly 90% of the advances made by the Tanzania Rural Development Bank were recovered on time, but after the present Crop Authorities took over this function collection had dropped to about 30% of the amount due. The President stressed the need for the Financial Institutions to support the new Cooperatives by providing simple accounting systems, which could be operated by village leaders. Expansion of Inter-African Trade: An agreement has been reached with Zimbabwe for the exchange of goods to the value of shs.5 million during 1983. Tanzania will send timber, sisal fibre and twine, aluminium, sea foods and salt and receive in exchange coke, animal-drawn farm implements, sanitary ware, bakers’ yeast, hurricane lanterns and blair pumps. A similar agreement with Mozambique has been extended to include food and manufactured goods. Large Scale agricultural production: In 1983-84 the National Agricultural and Food Corporation (NAFCO) plans to extend the area under maize in Mbozi District from 600 to 1100 hektares and to establish a maize farm at Nantumbo in Ruvuma Region with an eventual area of 3,900 hektares, of which 200 hektares will be brought under cultivation in 1983-84. The total cost in 1983-84 will be shs.21 million, of which 3.4 million will be a grant from the Netherlands Government for the farm in Mbozi District and 10 million a grant from the USSR Government for Nantumbo. Sugar is said to be selling informally at shs.30 to shs.40 a kilo, although the official price is shs.11 a kilo. Low production is attributed to lack of spare parts and bad weather. Two factories have closed and output is reduced at others. A major expansion of production is planned, which will triple output by the end of the decade. A new mill at Kagera, replacing the one destroyed by Amin’s troops, has been built and will be in production this year, though it cannot function to full capacity until the sugar estate is provided with irrigation. A French financed factory for processing clove oil on Pemba was due to go into production in May with a capacity of 150 tonnes of oil a day. Production of salt in 1982 was 29.2 tonnes and fell considerably short of national requirements. The principal source is the Uvinza salt works, where facilities are being extended with the help of a loan from Italy. Ten years ago half of the production from Uvinza was exported to Burundi, Zaire and elsewhere. Smaller amounts are produced in salt pans on the coast. New coastal salt pans are being built at Nwambao, Sadani and Changwahela, the last two being expected on completion to have a productive capacity of 45,000 tonnes per annum. Tanzania’s coconut production is expected to continue to fall for the next 8 years because her stock of palm trees is over-aged, although new plantings are expected to bring an improvement after 1990. As a result, Tanzania, once a net exporter of copra and other oil seeds, is now a net importer of vegetable oils and there is little prospect of a resumption of copra and coconut oil export for the next 10 or 20 years. The devaluation of the Tanzanian shilling by 20% against the US dollar took effect on 3rd. June. The new rate will be shs.12.2 to the dollar (the old one was 8hs.9.7 to the dollar). A previous devaluation of 10% took place in March, 1982. As discussed elsewhere in this Bulletin, the IMF is pressing for a more substantial devaluation. It may be that the Tanzanian Government is attempting to move to a compromise position by stages. The International Development Association of the World Bank (IDA) has allocated shs.420 million towards the cost of an underground electric power plant at the Mtera dam in Iringa Region. The dam itself was completed in 1980 as part of the Kidatu Hydroelectric complex. The Tanzanian Government will contribute shs.1,372.8 million and negotiations are proceeding to raise the remaining foreign exchange from Sweden, Norway, the Federal Republic of Germany, Kuwait, Italy and France. Agreement has been announced between the Tanzanian Government and the multi-national firm Lonrho over the compensation to be paid for the Lonrho assets in Tanzania, which were nationalised in 1976. The nationalisations were a political move against Lonrho, which was accused of assisting the illegal UDI regime in what was then Rhodesia. The Chief Executive of Lonrho, Mr. ‘Tiny’ Rowland, stated in a radio interview that the company expected to resume operations in Tanzania, but President Nyerere has made it clear that Lonrho will not be allowed to come back unless it gives a satisfactory answer to the allegation that it is supporting Jonas Savimbi, the South African backed dissident group in Angola. During the budget debate the Minister for National Education, Mr. Jackson Makweta, accepted that there is an urgent need to expand secondary and university education. Such expansion would have to be on the basis that students could be non-resident and would have to use low-cost buildings.